Still life painting have been a popular subject in art for many centuries. Although some might find the subject matter curious or even, perhaps, "boring," there are many reasons why artists - including myself - enjoy painting still life subject matter. Composing an interesting still life is not as simple as tossing a few pieces of fruit on a table cloth; an artist tries to look for an interesting combination of color, texture, light, shadow and sometimes even tell a story. Still life painting can also be a good way to practice techniques or get familiar with a new medium, without the daunting challenge of creating a portrait or detailed landscape. Still Life paintings are traditionally defined as an image of "anything that does not move or is dead." Still life paintings can contain symbolism and allegories on life, politics and morality - or they can simply be an exercise in creating something aesthetically beautiful in color and composition. 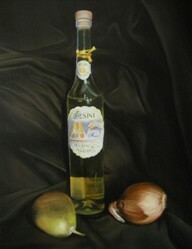 "Still Life with Yellow Onion"
I love painting onions, both in large still life compositions or close up, by themselves. An art teacher once told us students to practice painting onion skin as it is very similar to painting human flesh tones - and he was right! This painting was based on a great close-up photograph I had of an onion. I loved how some of the outer skin was peeling away, almost like a flower blooming. I sketched the image quickly in burnt umber paint, and then built up numerous layers of glazed color to get the translucent look of onion skin. It's one of my favorite still life works that I've created. "Still Life with Three Plums"
This painting was another great challenge, but a lot of fun to work on. Plums have unique skins, both opaque and translucent at the same time. I wanted to capture their softness, as well as the rich blue-red-purple colors of the skin. This was a fun one. I had a unique photograph of a cracked open coconut on a textured, marble-like countertop. Painting white objects is always a challenge because there are actually so many colors that can be used to give them depth and shape, here the open cavity of the coconut. I also liked the outer shell of the coconut with its rough, "hairy" skin. This was painted again after a quick sketch in burnt umber paint, primarily focusing on getting the roundness of the coconut correct. The background was completed through numerous glazes of thin color. If you enjoy my still life artwork, you can buy prints, mugs, note cards, tote bags, jewelry and even more featuring these designs in my CafePress storefront! Most of the images shown here are available in numerous designs, plus other pieces not featured on this page. Just click on the image of the painting you like to see what type of merchandise is available. You can also check out my art website, Nicole Pellegrini, for more examples of my work in other mediums and on other themes. This one was actually extremely difficult to paint! Trying to capture the glossy outer skin of an avocado, along with its rough, bumpy surface, was no small challenge. I started this one with a grisaille underpainting and slowly added the greens and browns for the skin, working back and forth in mostly opaque color application. "Still Life with Olive Oil Bottle"
This painting took a great deal of time and work to capture the glass bottle realistically, and the way it reflected and distorted the cloth behind it and the pear to the bottom left. It's painted on gesso board, again using the verdaccio approach to underpainting and then color glazing. I'll admit papayas aren't my favorite fruits to eat! But they are pretty and have a lot of variety in the coloration of their skins, which make them fun to paint. Yellows, browns, reds and greens on the skin of the papaya were captured here in multiple glazes of thin color. I hope you enjoyed this little tour through my still life "gallery." Comments and critique are always appreciated...and be sure to check back in the future to see what new work I've added. Thank you! It is amazing what art a simple subject can make. Stunning! A beautiful gallery showing of still-life paintings! Lovely paintings! I remember hearing that onion tip in an art appreciation class. I'm not an artist myself, I lack the skill. But I do appreciate it! One of my favorite subjects in drawing and painting is doing pet portraiture. Here are some examples of my favorite cat portraits. "Space Art" is a genre of painting centered around creating fantastical landscapes, worlds, and visions of the future. Enjoy these images of space art created by the author.